Most of us know of the famous "email list". However, it's even more common that we have no clue how to start them, or what to even do after you set it up. Mostly, why this is even important in the first place. We are all told that from the start we should have an email list.... And that's pretty much it. "It converts followers into clients" or "if your website magically goes down, what will you do?" Are commonly said phrases. First off, let's cover why your email list is so important in the first place. I mean, you have social media right ? What do you need a list for ? Having an email list is one of the most targeted ways to reach your audience that CARES. When you sign up for an email list, most often it's because you wanted to see more content by them, they offered an incentive, or you signed up for a webinar or something like that. You normally don't just sign up without an incentive. If you do, then you're definitely interested in their content. With social media, anyone can follow you, and for a number of reasons. Maybe you were featured somewhere, or perhaps they just liked your feed. Your email list is often filled with the followers who show up often. I can definitely say that I recognize a lot of names from my Facebook group and Instagram. It's very important that you start creating your list early, so when you have a product, service, ect. You already have an audience to sell to. This is the main reason a lot of people create email lists to begin with. Say you have been building your list for a year, and you have 1,000 email subs. Awesome job! Once you have a product or service you have 1,000 people who your email is guaranteed to hit their inbox. On the other hand, if you don't have a list it can be a bit harder to reach your ideal audience. You would kind if just be shooting in the dark. So of course it converts followers into customers. Think of this on a larger scale. You hear about a new brand and you're looking at the shop. An email sign up box pops up and it says join the list for 10% off. So you sign up, and you buy something. They can continue to contact you about new sales and new releases which gets you to become a repeat customer. Not everyone is going to convert. You'll always have the people who don't want to pay for an ebook or who don't want to pay for online courses or webinars. There's so much free stuff out there, why would they? However you stand a better chance this way. So, what do you do once you have your email list? This is probably the part that stumped me the most. I knew it was important for the sake of growing my target audience. What I didn't know is what the hell to do once I had it. I still really don't (haha!....yeah there we go. I admit it.). However, none of us really ever know 100% what we are doing so it's all good. Email lists can be used for plenty of things. Some of which I listed above. However there's so much more you can offer your list ! You want your audience to feel like VIPs. I aim for this so often, and I hope my email subs feel this way. You can achieve this by offering exclusive freebies, pre-sale information, new blog post updates, give them sneak peeks of your latest project, ask for feedback, etc. Your email list is your own little personal army of dedicated friends. feedback is one of the most valuable things we can receive from our audience. When you receive feedback, you can then tailor your content, products, services, etc. to the needs and wants of your audience. There's no guessing and checking here! They are literally telling you what they want. So make a small form and send it out! I got a lot of great results from my last survey. This can be done with monthly freebies, weekly coupons, or really anything. Think about the email lists you're subscribed to. What do they have to offer that makes you want to stick around? I give away my free monthly calendars, and I also have my email list on my priority list to get any freebies I give away first. This is of course a little different for me because I don't have a product to sell (yet!). So I have to get a little creative. Make sure that your email list doesn't just feel like a marketing platform. Nobody wants just emails about products or services all the time. Make sure to send at least one email every once in a while with nothing but useful information! The reason they are around is because you're helping them in some way. So supply them with some value about a topic they might relate to. 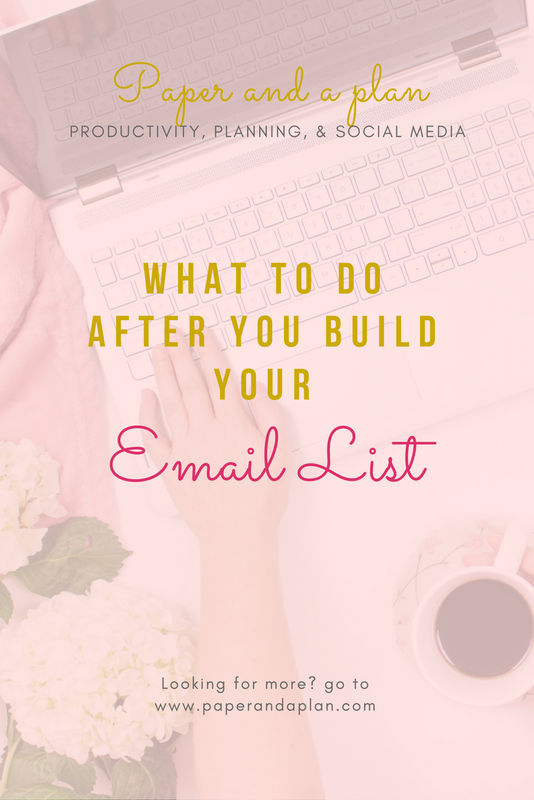 I really hope this post helped give you some insight about email lists and what to do with them. PLEASE if you have any questions at all, leave a comment on this post and I can get back to you, or go to my contact page and send me an email. I would be happy to help!